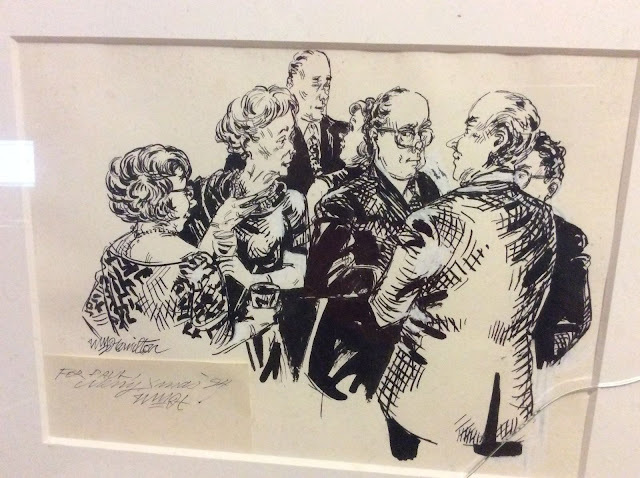 An autograph drawing and letter in French dated 19 October 1970, bears the printed address of Monica and Ronald Searle's Paris apartment at 4 Rue Antoine-Dubois. 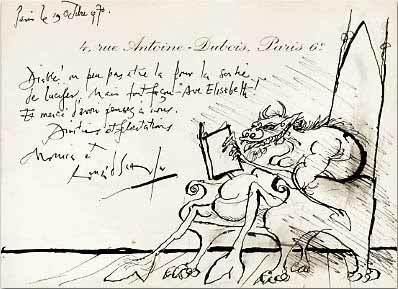 Searle, who could draw as well in French as in English (I can't vouch for the writing), has given his lucky recipient a compellingly grotesque image of the devil immersed in a book. Personally, I love the tension of the chair tilting off to the right as Lucifer leans to the left, his cloven hooves contrasted with the claw feet of the chair. 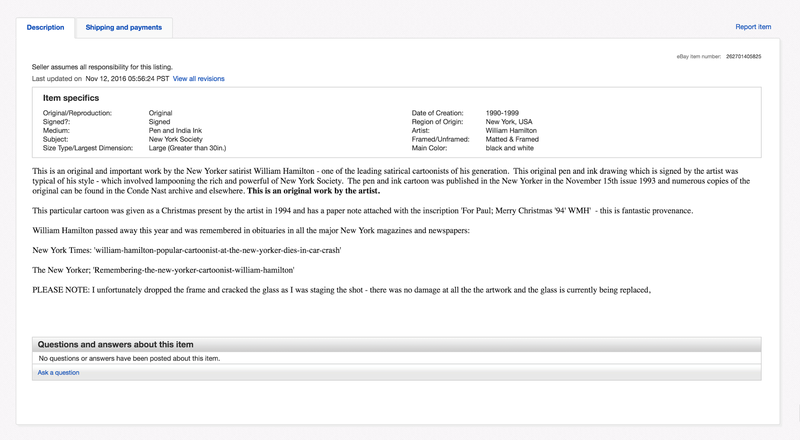 Note: I downloaded this image years ago, pre-blog, most likely from a site where the original note was offered for sale. I am happy now to restore it to the internet even though I have no information at all about it. I would be pleased to hear from anyone who does know a little something about the letter, or who can make the French out well enough to render it in reasonable English. Other inspired scribblings of Ronald Searle, particularly those new to the 'net, are always welcome here. 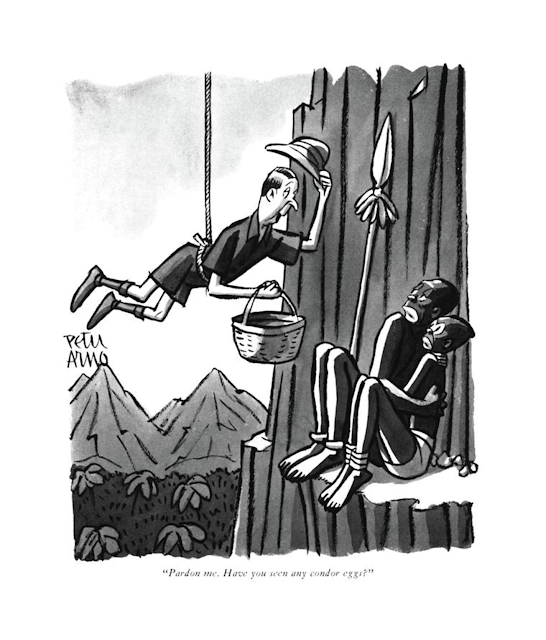 Exhibit A: The Cartoon Collections Caption Contest #12 with a drawing by Mick Stevens. My entries follow, if it please the court. "My client pleads not guilty to any copycat crime." "My client is no more guilty than I am." "Mr. Zelig wishes to represent himself." "My client wishes to represent himself." "My client pleads not guilty to identity theft." 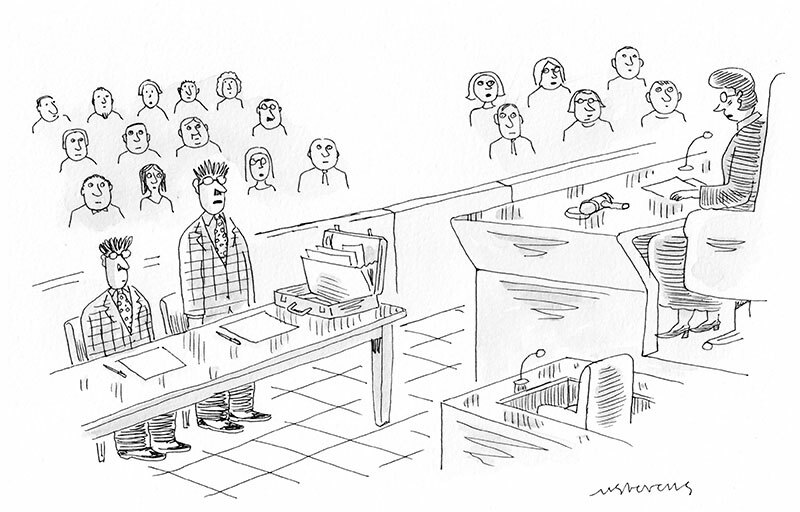 "My client pleads not guilty to anything but good taste." "Not guilty, plaid and simple." "Not guilty by reason of inanity." 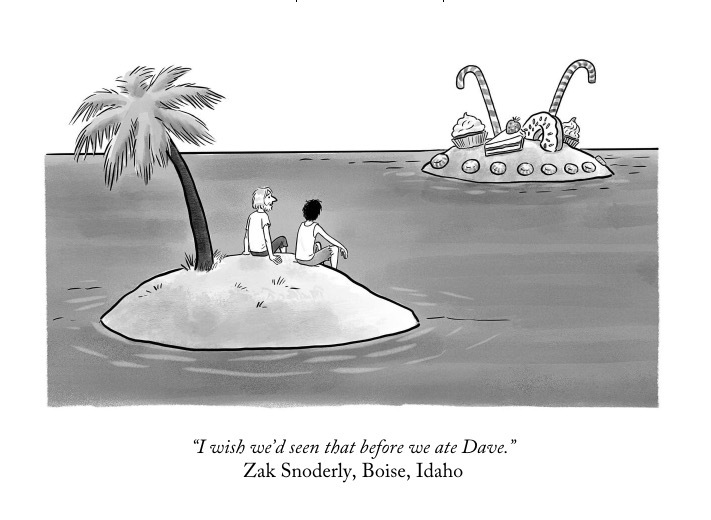 Take a bite out of my entries in the Moment Cartoon Caption Contest for January/February 2019. 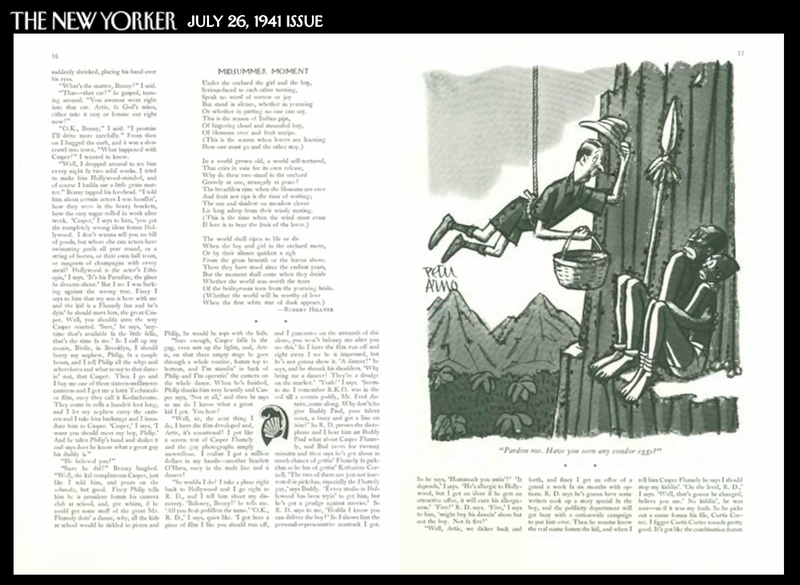 Moment is a magazine which covers topics of Jewish interest and many of the caption contests invite efforts at Jewish humor. Multiple entries are permitted. The drawing is by Benjamin Schwartz. "For you, my personal favorite: deviled ham!" "How much could it hurt? Take that ham sandwich and add a little cheese." "Wrong guy. I'm the spokesman for Underwood." "Try a second bite, this time without all the guilt." "See? It's even better than kosher." "It tastes better if you don't think about what's in it." "It's just like Mom never used to make." "Job didn't like my sandwiches either." "Now we sing 'Cheeseburger in Paradise.'" 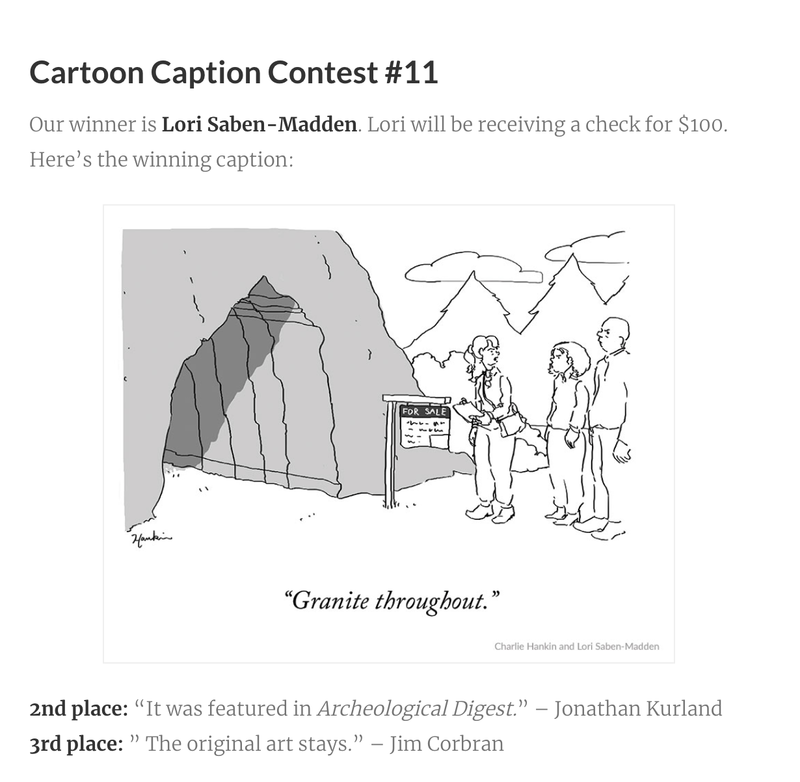 Note: Last year's Moment profile of some of the Caption Contest contestants may be found here. 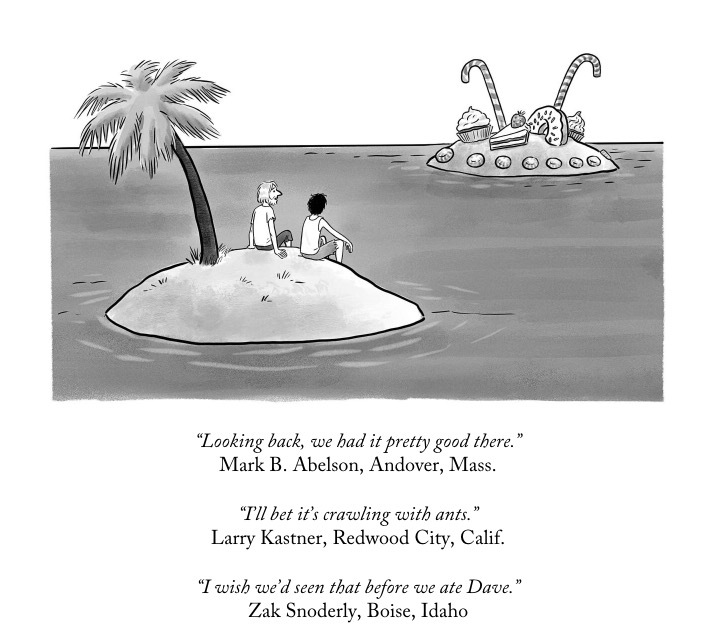 Gaze longingly upon my entry in The New Yorker Cartoon Caption Contest #651 for the issue of February 18 and 25, 2019. 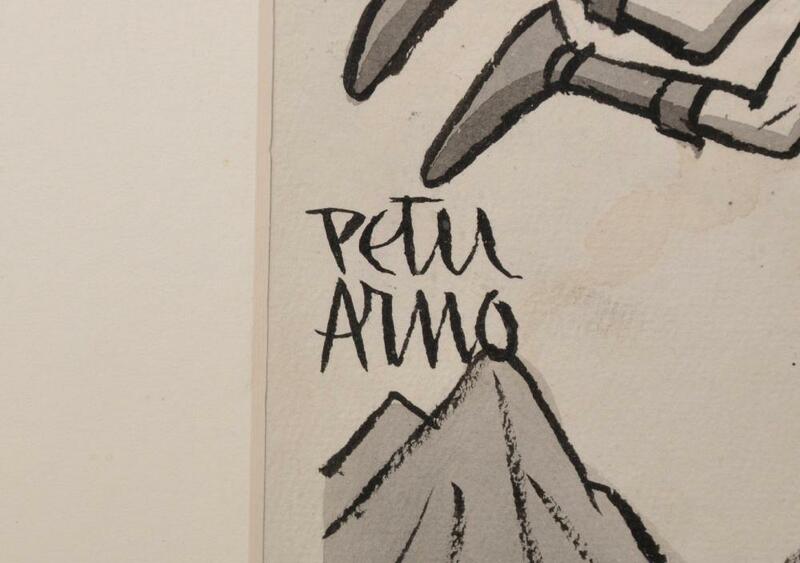 The drawing is by Pia Guerra. "No, Todd, the irony is not lost on me." "Look at the bright side. Our insulin went down with the ship." "The last thing we need is tooth decay." "I'm content to marvel at nature's wonders." 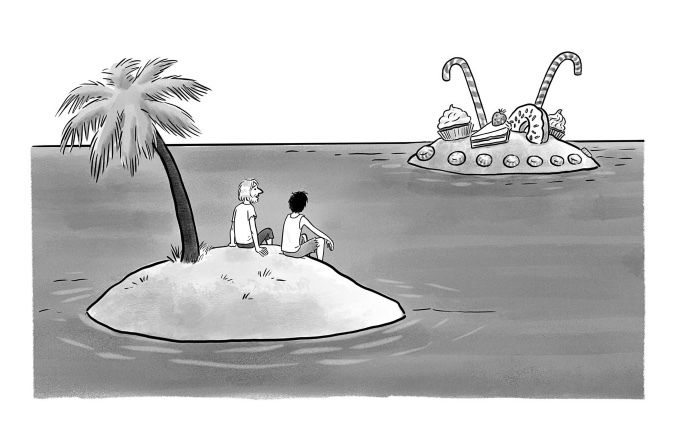 "That palm tree could be a sling shot…for one of us." "My biggest regret is never learning to swim." March 11, 2019 Update: I voted with Andover, of course. I found the second unappetizing and the third…well, dark. 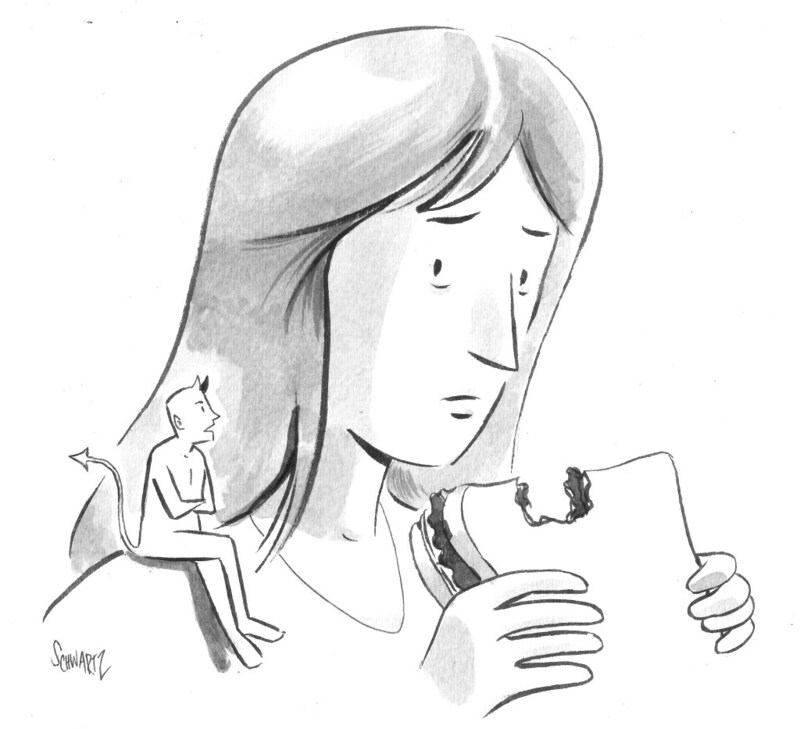 Note: Last week cartoonist Sofia Warren brought a patient wrapped in a boa constrictor into the doctor's office. 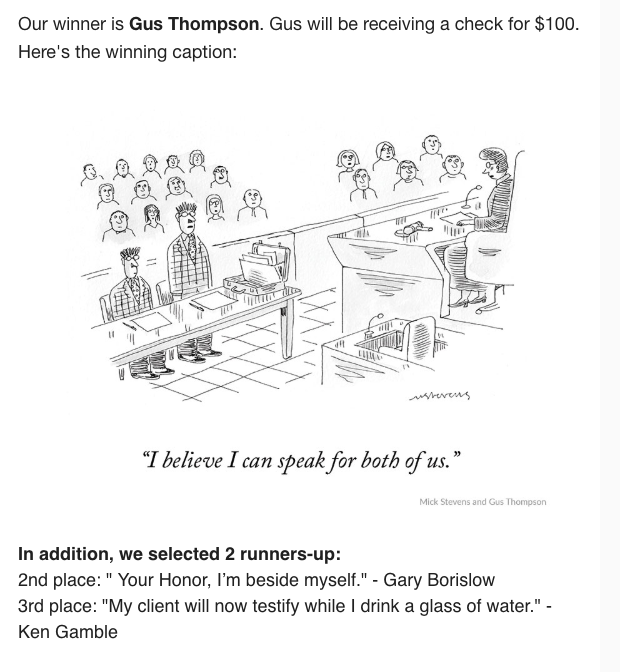 My caption couldn't charm the snake—or the judges. Squeeze into Contest #650. Anthony Summers, in his 1993 biography Official and Confidential: The Secret Life of J. Edgar Hoover, alleged that back in the 1950s the FBI Director had been seen cross-dressing at all-male parties. The book was published on March 2, 1993 and the salacious parts received extraordinary publicity. The idea of Hoover as a cross-dresser has since become a part of popular culture, although historians have found no evidence to support it and much reason for doubt. At the time of the book's publication, cartoonist Leo Cullum was on the case in the pages of The New Yorker. 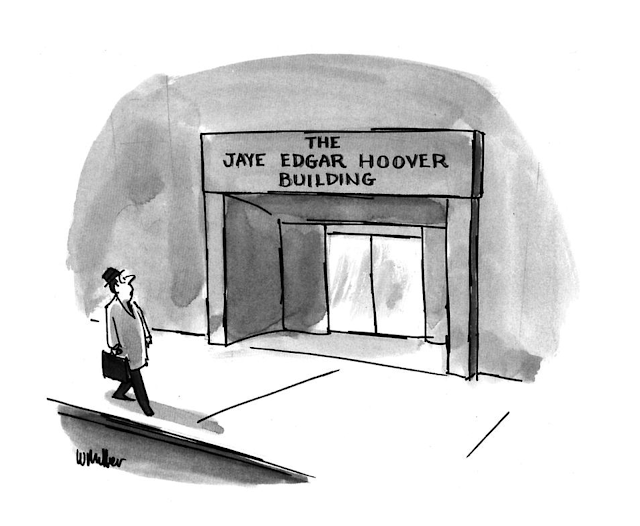 The story was so widely noted that although more than two decades had passed since Hoover's death there was no need to have his name appear in the cartoon. 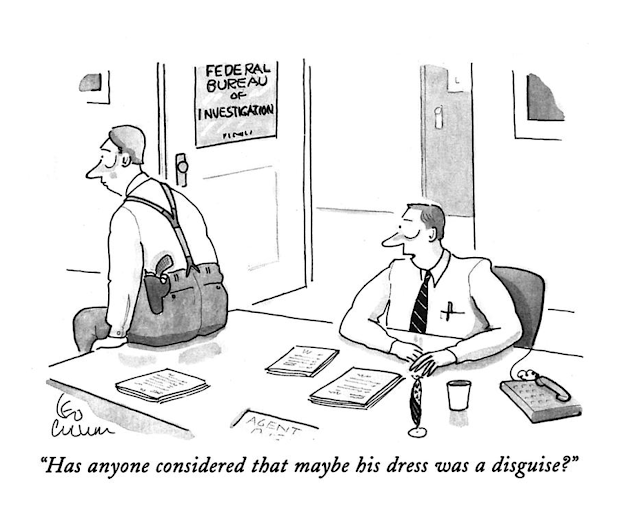 Later in the year the subject of cross-dressing was to come up again in a William Hamilton cartoon. While this one isn't a direct commentary on the J. Edgar Hoover story, it might never have seen the light of day without it. 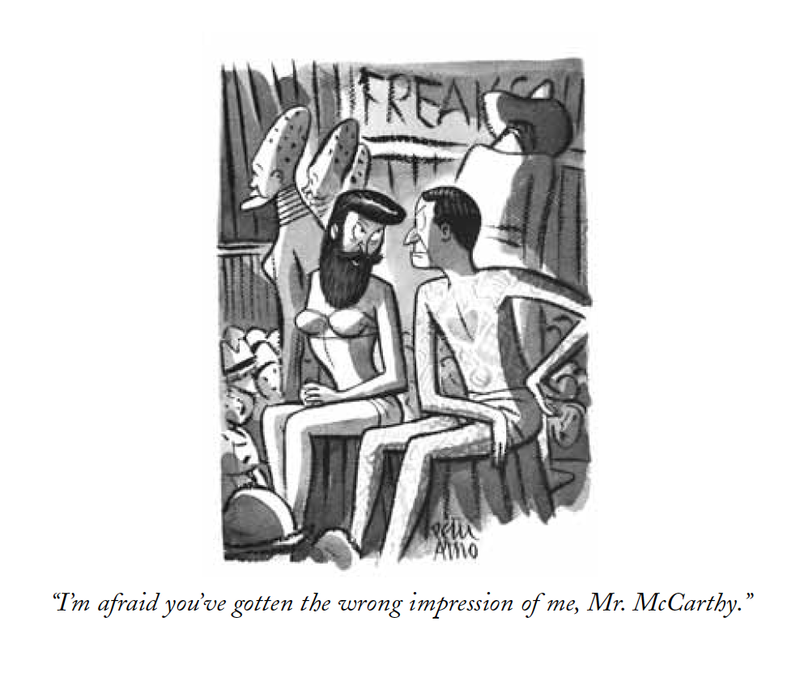 Cross-dressing references are rare in New Yorker cartoons, but the national conversation had taken an unusual turn that year. Hamilton's original artwork shows one of his many cocktail party groupings. An older woman is asking her husband to recall where exactly they were when they caught a gossipy glimpse of a certain person in drag. The language is breezy and conversational, carefully crafted to recount not merely the scandal but the couple's exquisite travel history. 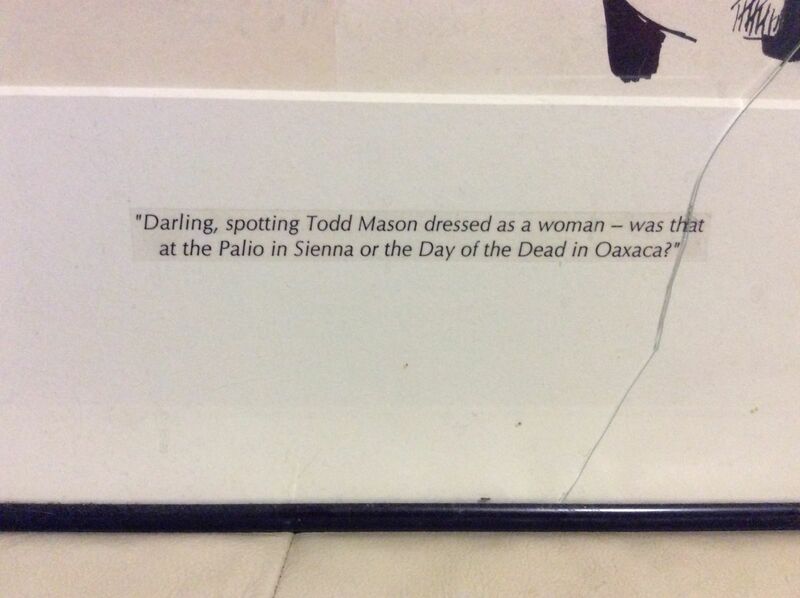 "Darling, spotting Todd Mason dressed as a woman—was that at the Palio in Siena or the Day of the Dead in Oaxaca?" The printed caption adhered to the matte misspells Siena. 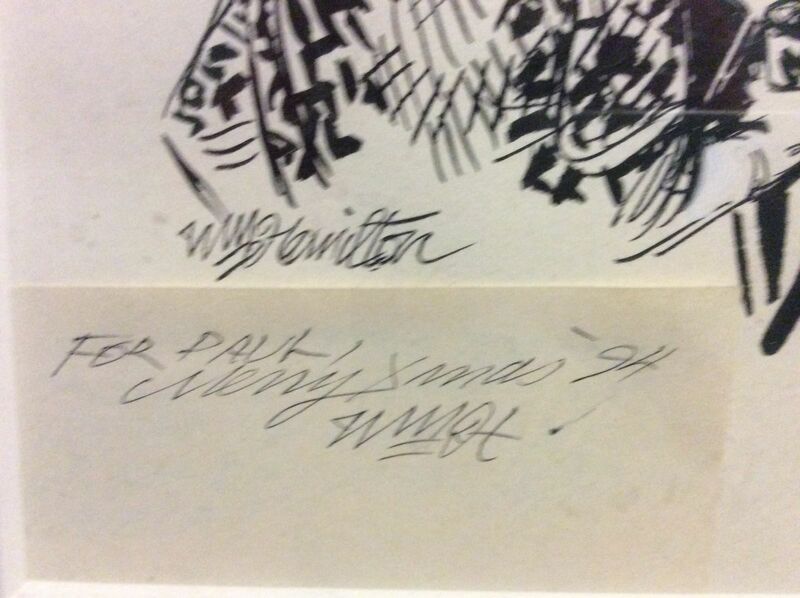 The art was a Christmas gift from William Hamilton one year after publication. The glass was cracked in "staging the shot" for eBay. The seller was going to have it replaced. The seller inadvertently photographed some addresses, a no-no in "staged" shots. Is the crumpled money meant to be subliminally suggestive or is it perhaps for scale? Note: I'm always interested in original art by William Hamilton (1939-2016). Readers are encouraged to send me scans or photographs of his art and to relate the stories behind them. 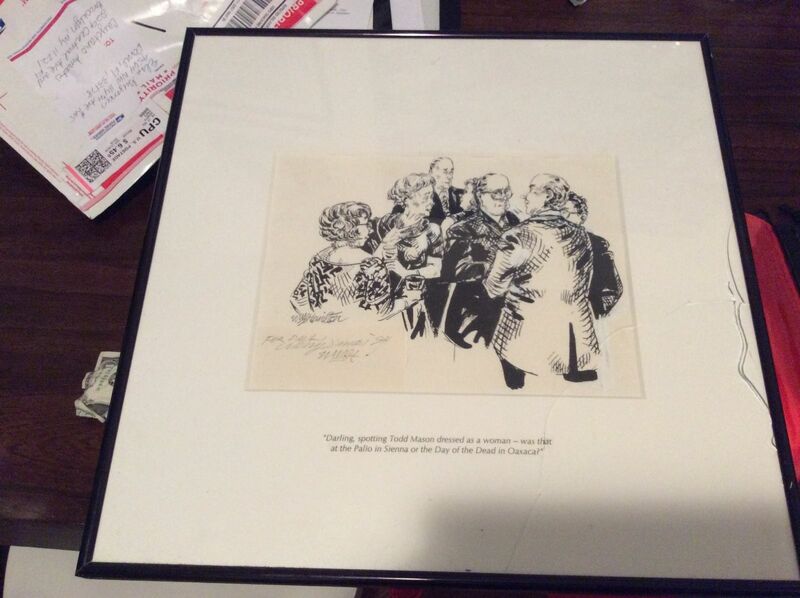 To my knowledge, the artwork in this post was not sold. Let me know if you know otherwise. Today's discussions of gender and gender identity are generally complex, nuanced, and increasingly divisive politically. 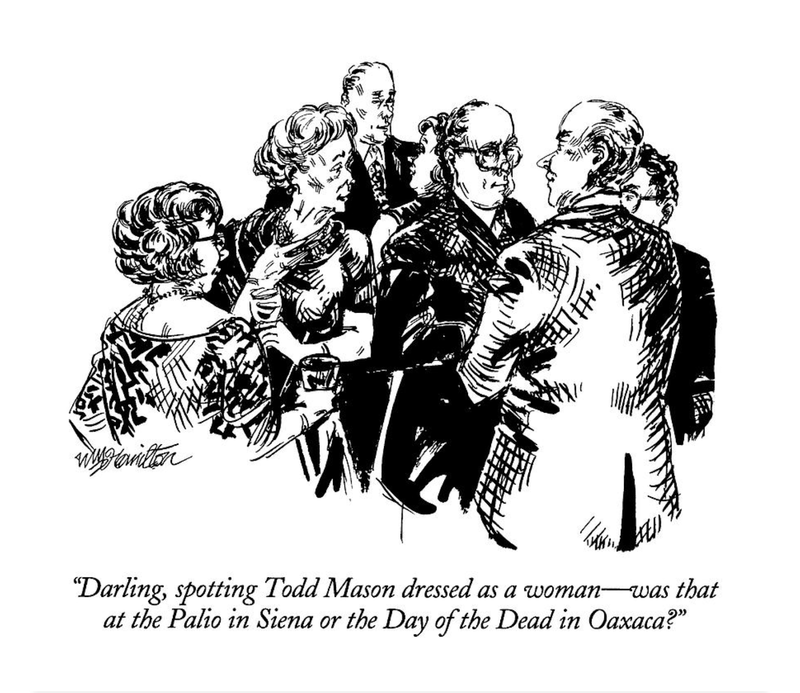 There is nothing at all nuanced about cartoonist Peter Arno's approach to the topic of gender definition some eight decades ago. 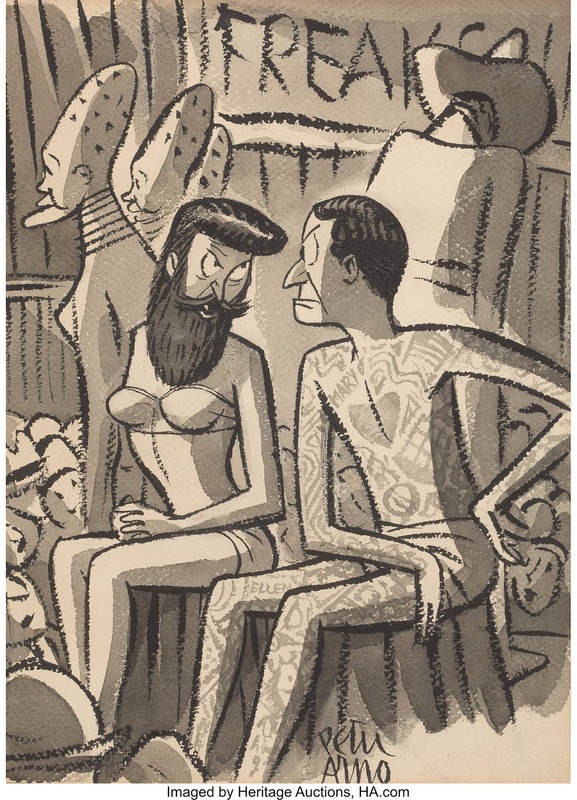 In 1937, the most obvious way to blur the distinction of the sexes was to draw the bearded lady in a so-called freak show. 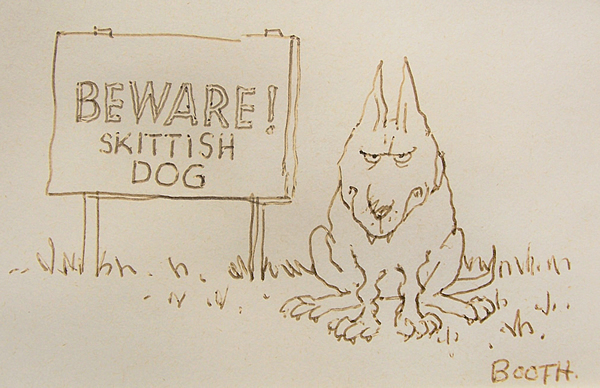 That horrific institution has mercifully gone extinct today, but not before cartoonists such as Arno and George Price, to name two, drew considerable material from them, much of it understandably grotesque. 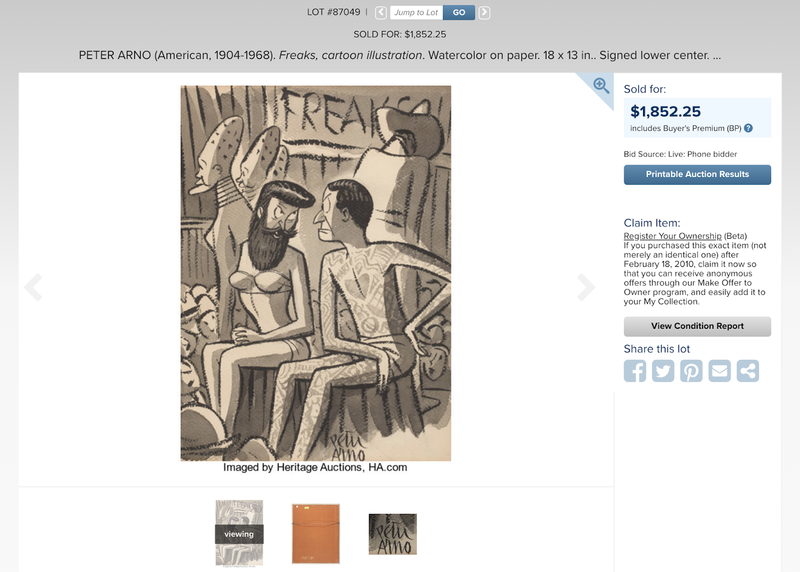 Arno's oddball drawing is so idiosyncratic and so bold that Heritage Auctions can almost be forgiven for listing it in 2010 as simply a "cartoon illustration." There is indeed a caption that goes along with it, as one might surmise by the fact that the bearded lady is rather forcefully speaking. 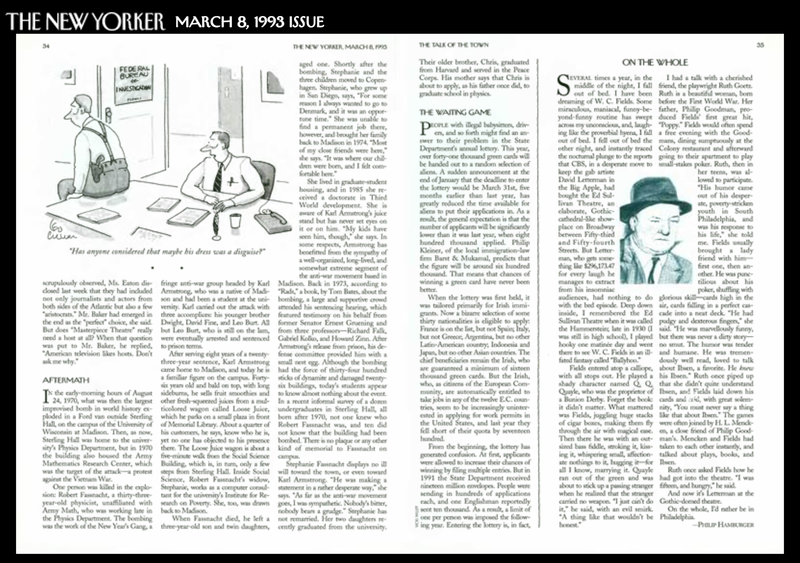 The drawing itself was published by that literary institution known to us as The New Yorker, a fact apparently never suspected by Heritage. Go figure. "I'm afraid you've gotten the wrong impression of me, Mr. McCarthy." Back in the 1980s, if you were shopping for original Charles Addams New Yorker cartoons, you could expect much of his work to fall into a standard price range. If you wanted an Addams Family drawing, though, you would have to pay a steep premium. 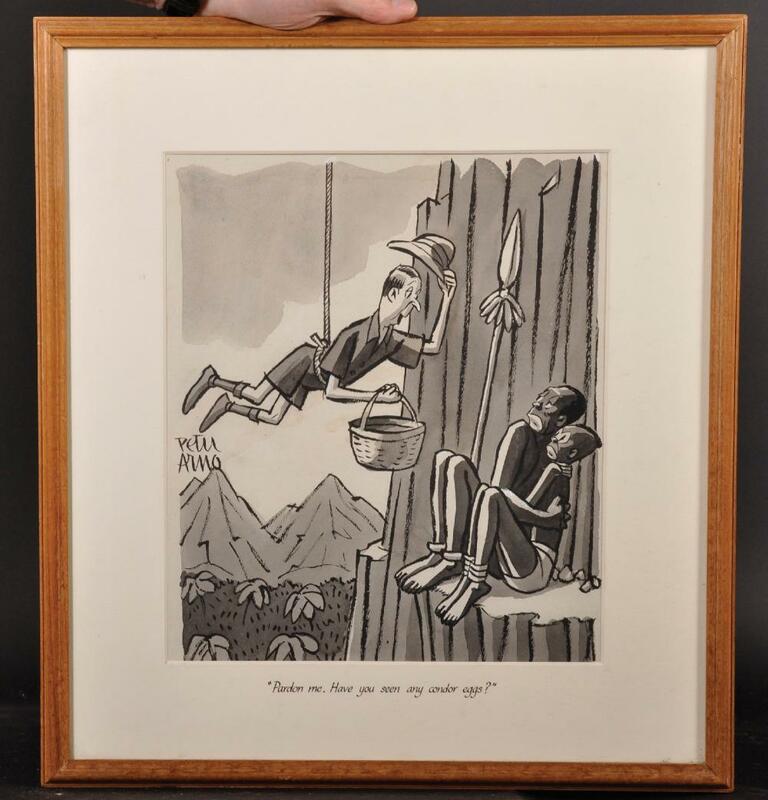 If you were willing to take a cartoon about a tribe of African cannibals drawn in questionable taste, you could get a real discount. 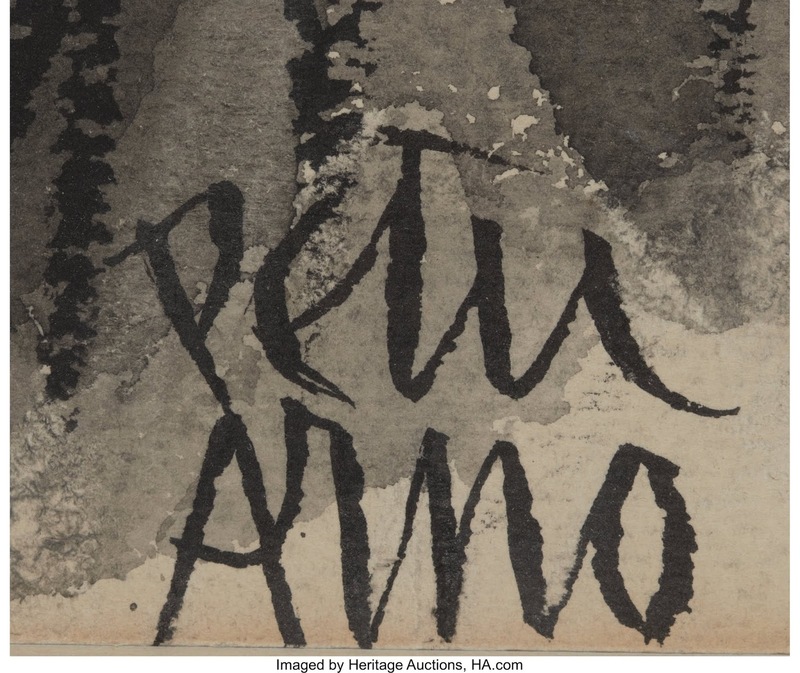 Next week the British auction market will test the salability of an original work by Peter Arno published in The New Yorker in the summer of 1941. 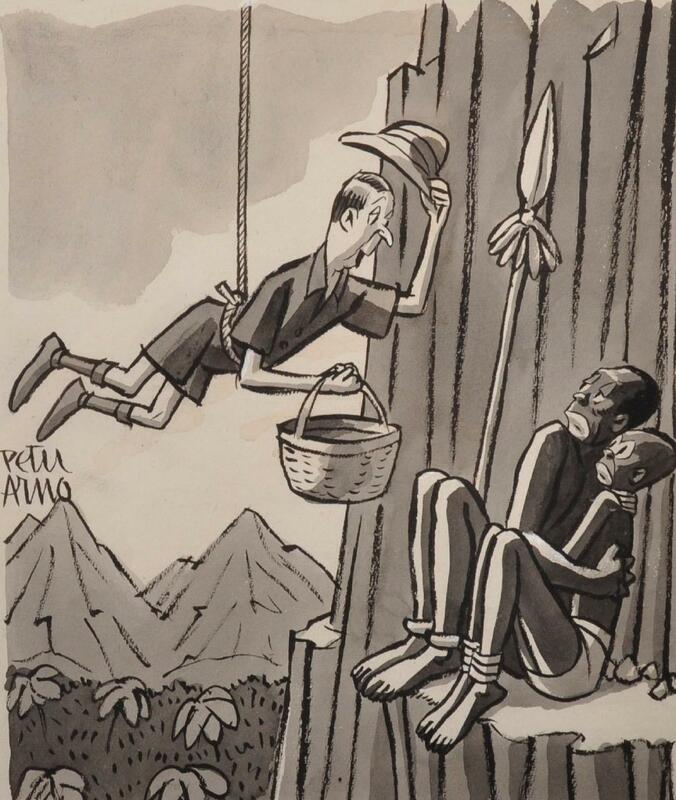 The drawing includes a pair of shockingly insensitive caricatures of African natives. Arno is one of the best cartoonists ever, but the conventions of racial caricature that were deemed acceptable, apparently, in the 1940s are quite rightly anathema today. Arno himself had no qualms about collecting this cartoon as late as 1957 in The Penguin Peter Arno. 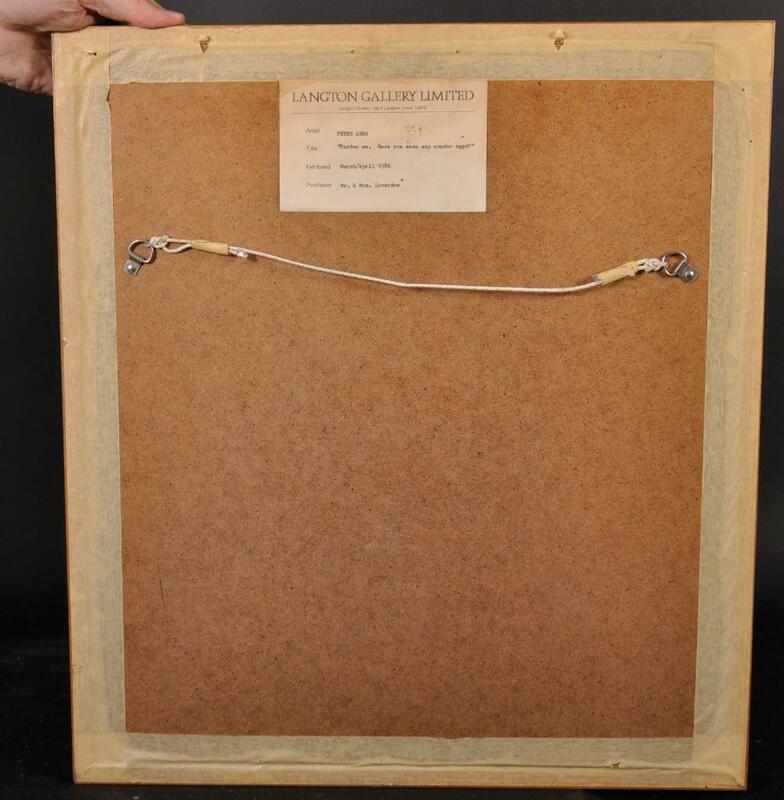 Bidding for the framed original art starts at 480 GBP ($625) with a presale auction estimate of 600-800 GBP ($780-$1045). 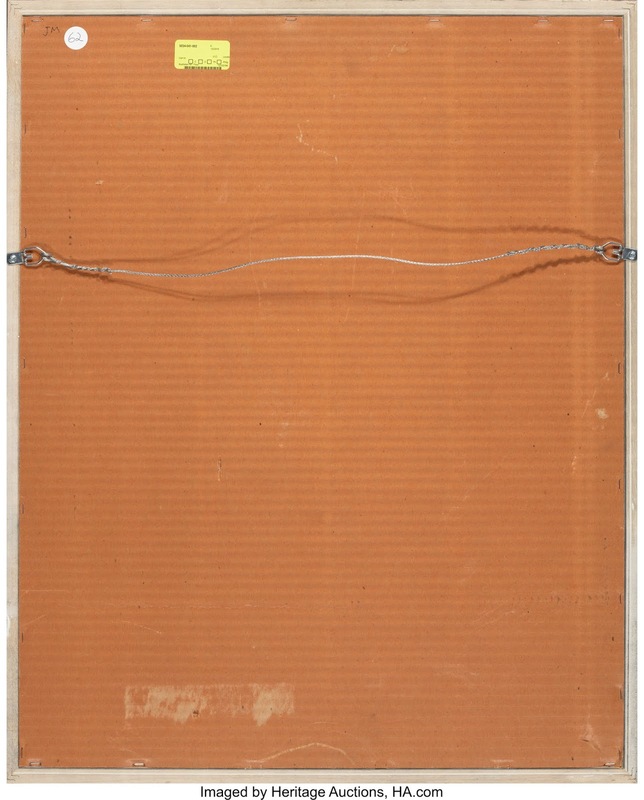 Will such an image find a buyer today? "Pardon me. 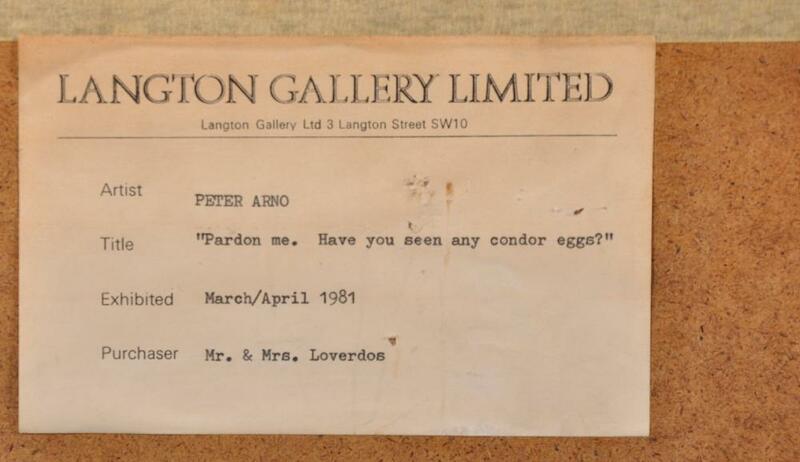 Have you seen any condor eggs?" February 27, 2019 Update: Sold! The original art went today for 550 GBP ($730) plus buyer's premium. 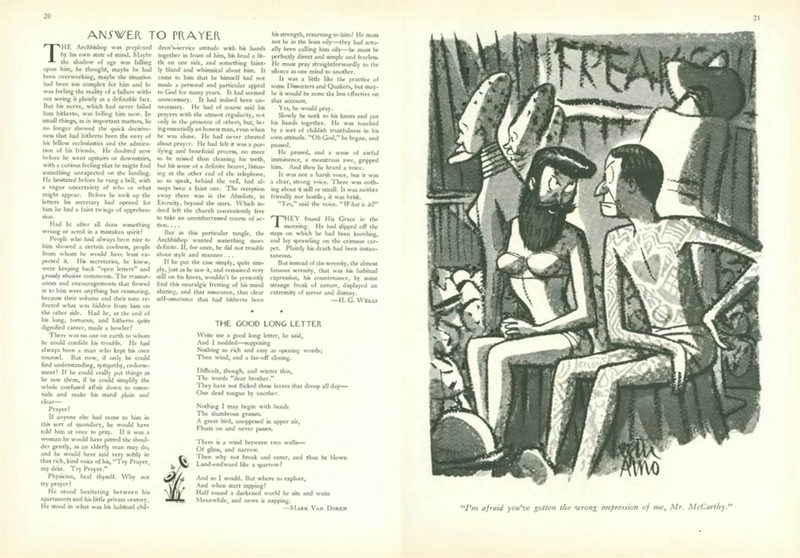 Racial caricatures of Africans and others were common in mainstream American publications up until at least the 1950s and likely beyond. A left-leaning magazine such as The New Yorker was no exception. Peter Arno was the most popular New Yorker cartoonist of his day, and like many others he created images meant to be humorous that today redound as deeply offensive. 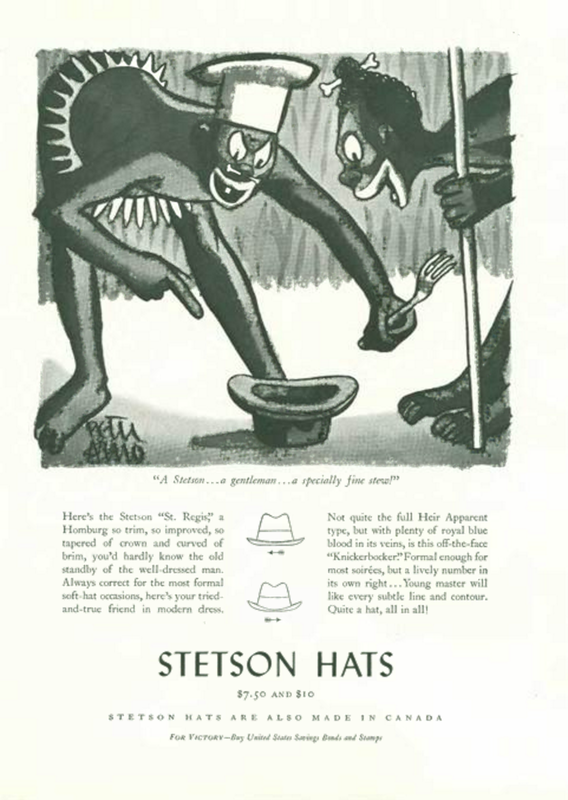 A 1942 ad featuring two African tribesmen marveling over the potential use of an inverted Stetson hat is meant to appeal to and amuse an upscale and sophisticated readership in the pages of The New Yorker. It isn't hidden away in the back of the magazine; it's right there on page one where everyone can see it immediately. No advertiser could expect to sell a hat or any other product by offending potential customers. 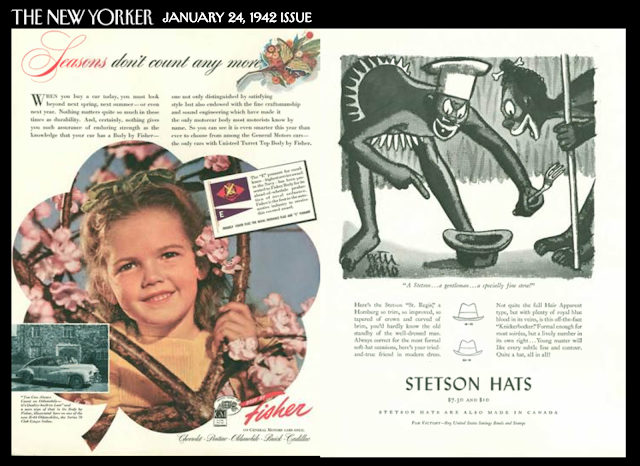 Racial and, let's face it, racist caricature would have to be broadly accepted by the culture for it to be used as a major element of such an advertising campaign. 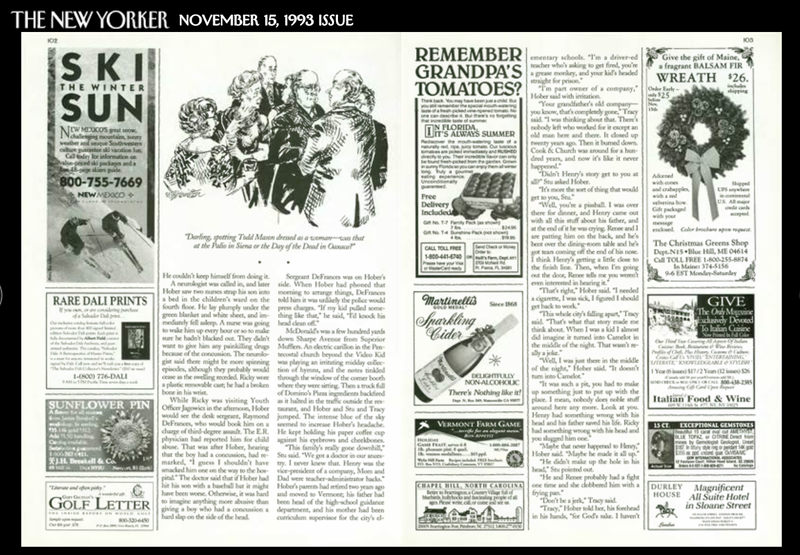 It would seem there wasn't a word of protest to be had from the artist, the magazine's editorial staff, the advertiser, its ad agency, and—so far as one can tell—the readers. "A Stetson...a gentleman...a specially fine stew!" Let's do a walk-through of the Cartoon Collections Caption Contest #11. The drawing is by Charlie Hankin. My entries follow. "I've finally found something in your price range." "It's a bit of a hole-in-the-wall." "You said you wanted rustic." "What are your feelings about grizzlies?" "Prepare yourself. 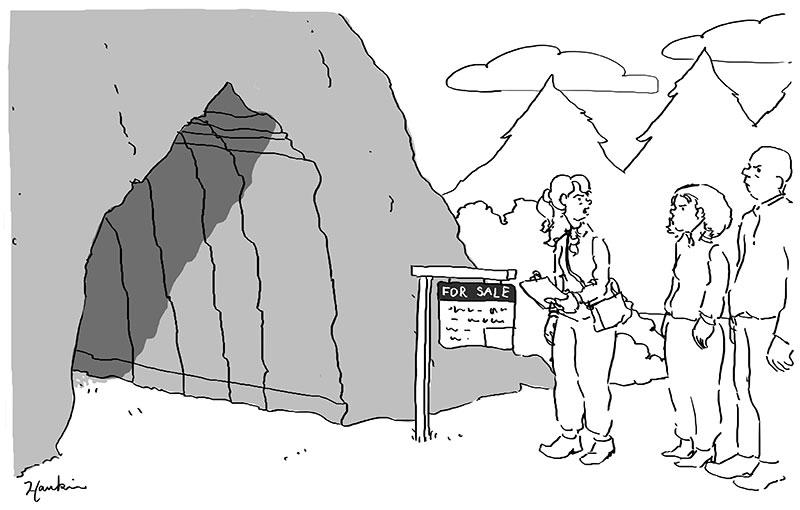 It's a bit of a fixer-upper." 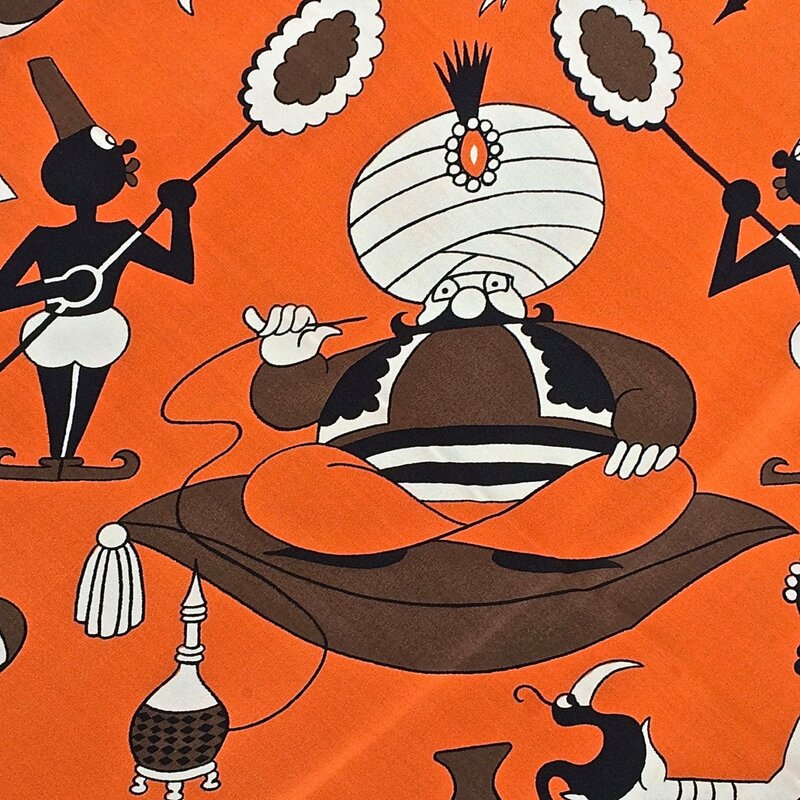 Otto Soglow's most popular creation by far is the Little King, so one can understand the eagerness of the Etsy seller who listed Soglow's harem-themed scarf to identify the sultan as "The Little King in a turban." Clearly he isn't the Little King. 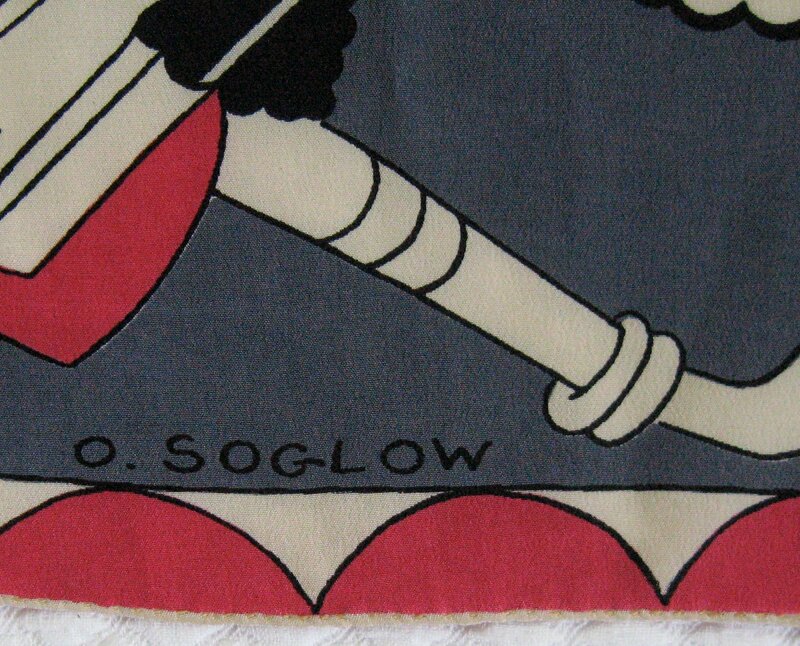 Soglow very deliberately kept his syndicated comic strip character out of the two scarf designs he created for Richard Farrar. 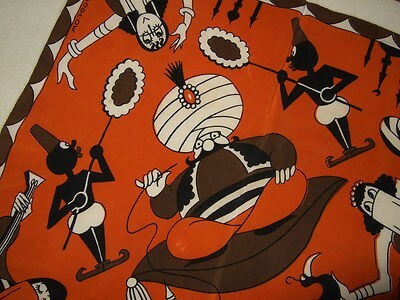 This particular design is best viewed as a diamond with the sultan's turban toward the apex. Just tilt your screen. 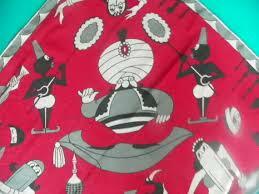 This particular scarf is disturbing to modern sensibilities on perhaps several levels, all originally meant to be amusing. 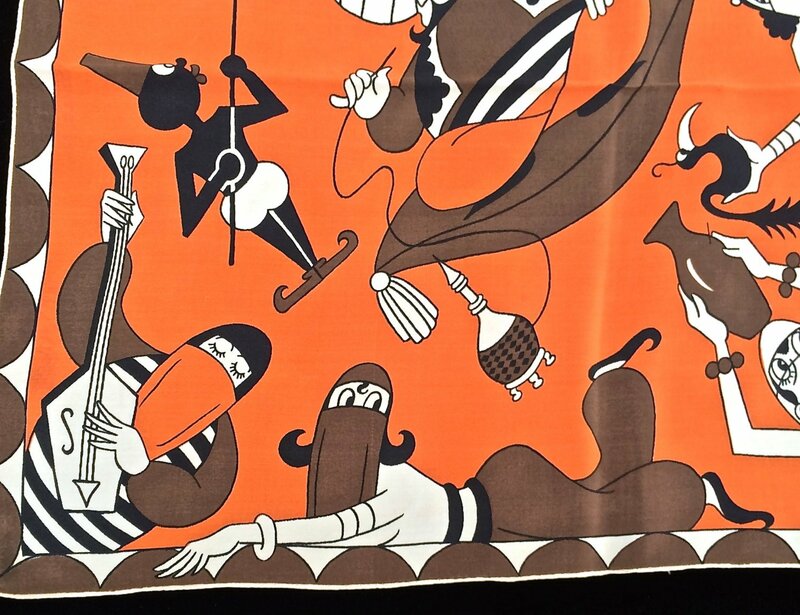 There is the stereotypical depiction of the sultan with his hookah, of course, and the happily-enslaved women. 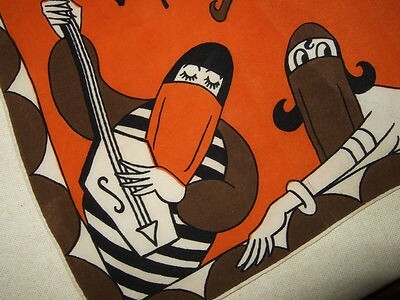 Most troubling is the racial caricature of the two servants. 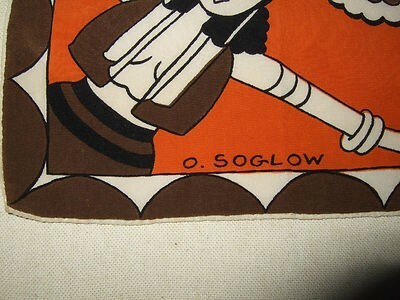 The sale price of the orange and brown scarf is not recorded. 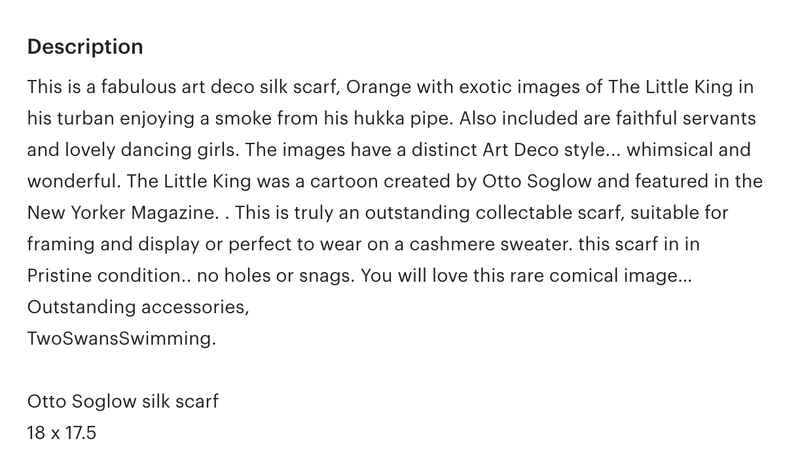 The seller writes, "Quirky Art Deco silk scarf is really a vinage [sic] New Yorker cartoon, The Little King…" Out of all that, the words quirky, silk, and scarf are 100% correct. 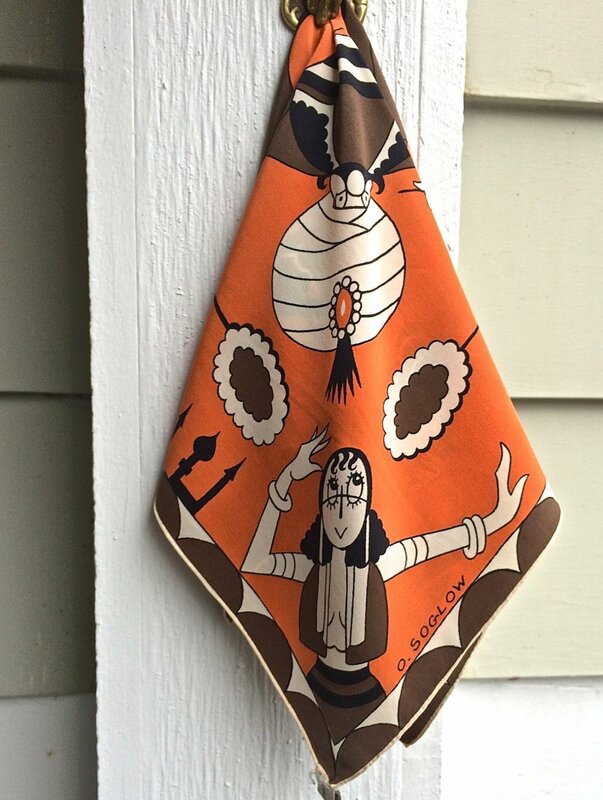 "…The Little King in his turban…"
Another Etsy seller offered a version of this scarf in dark gray and red, plus black and white. 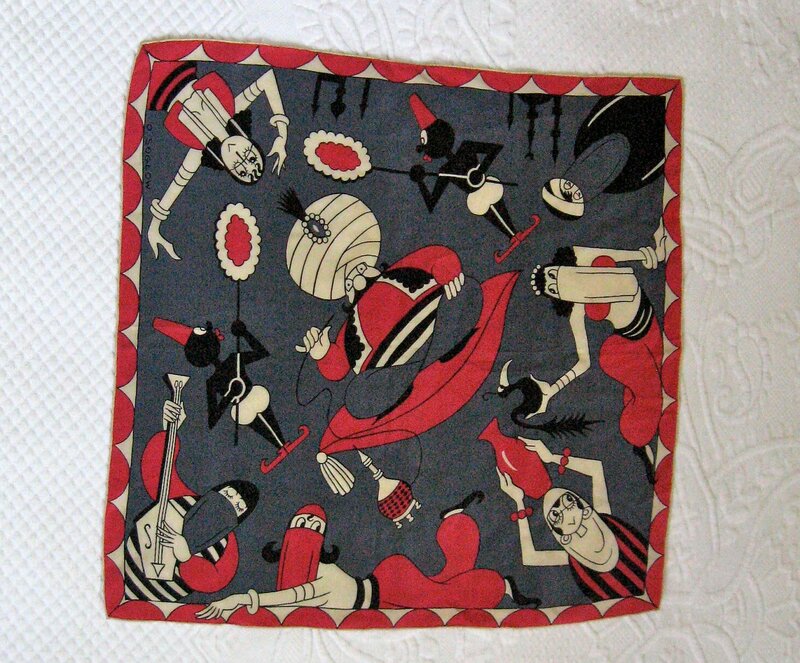 The seller dated this scarf incorrectly to the 1930s. 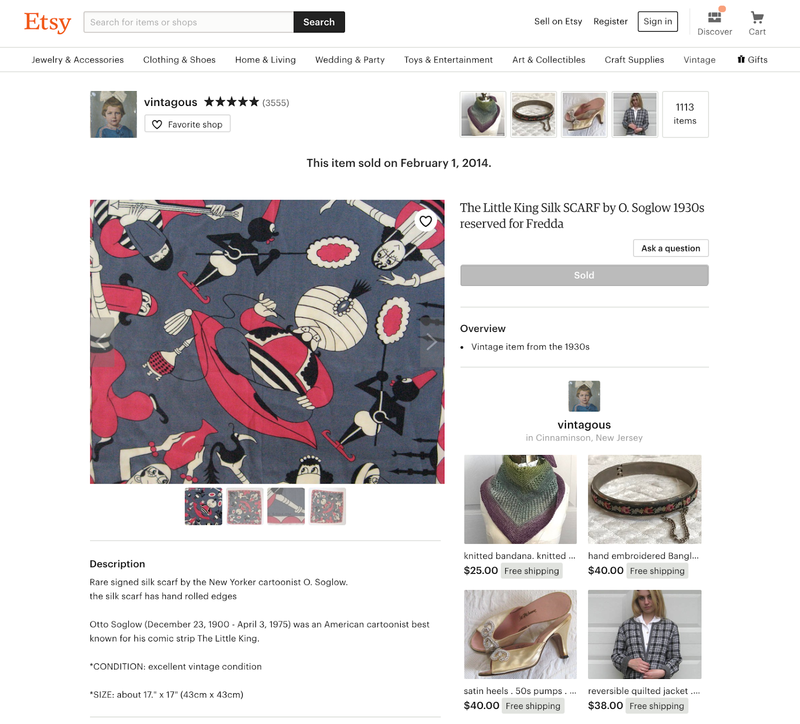 An eBay sale archived on Worthpoint shows the inversion of the red and dark gray colors. 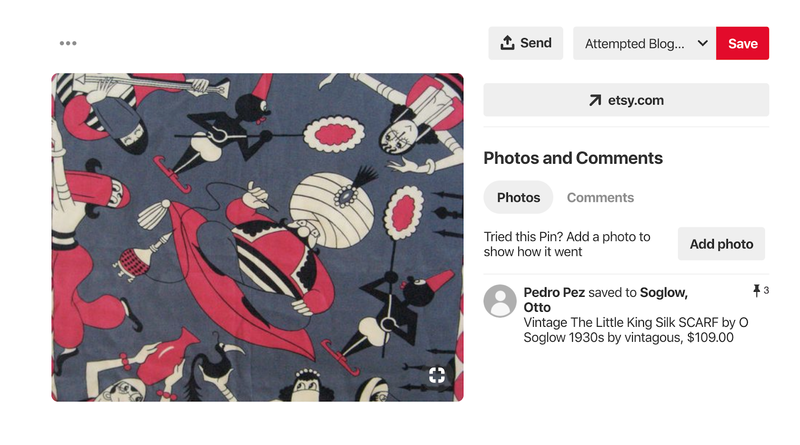 A third Etsy seller offers yet another color combination. 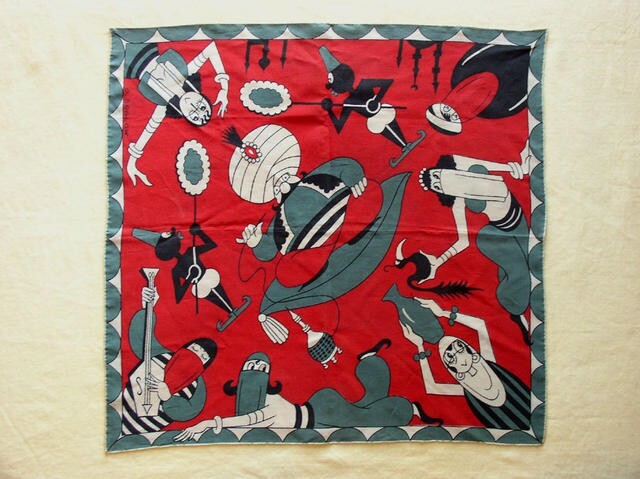 This seller also dates the scarf to the 1930s. It is more likely from the 1940s to 1950s. 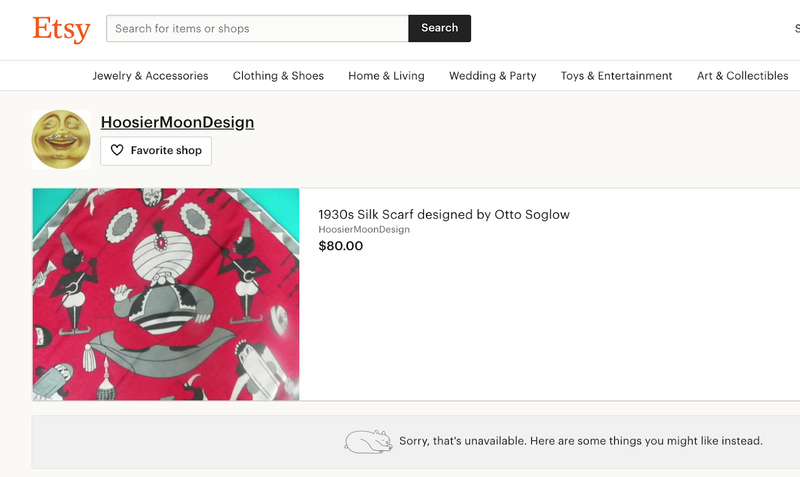 The scarf was offered at $80. 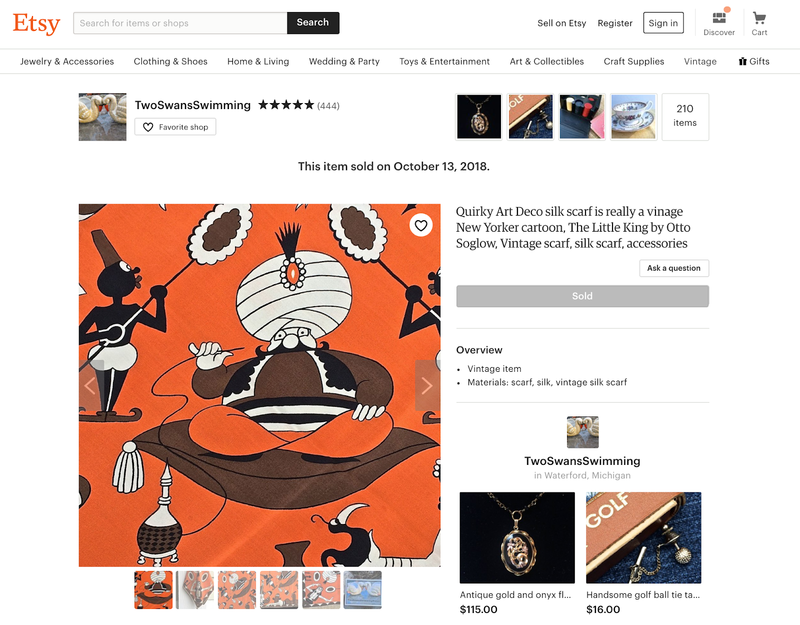 The seller currently has no items for sale. 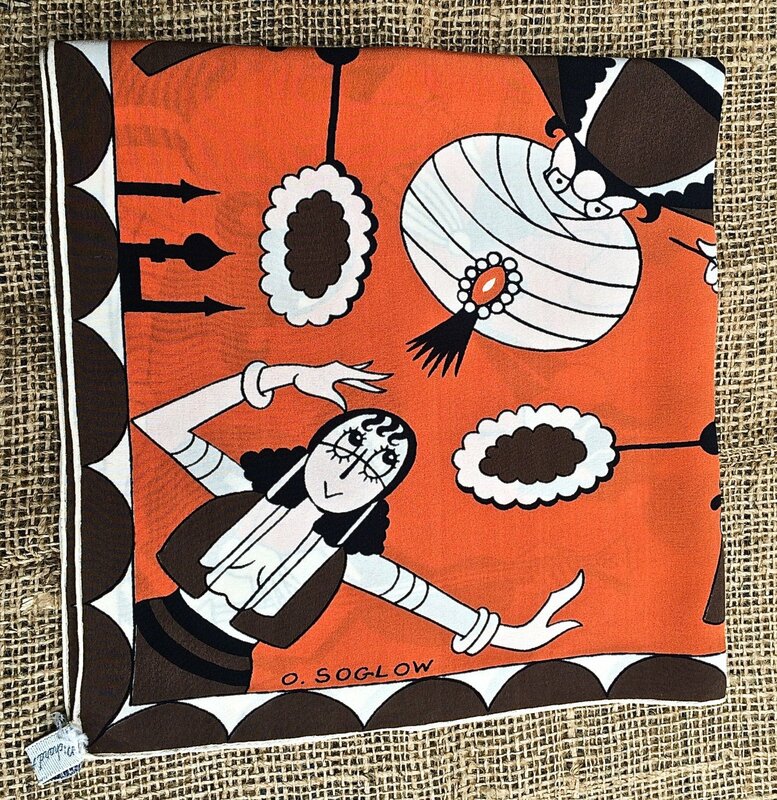 Note: A big thank you to Addams aficionado Joel Jacobus for first alerting me to the existence of the two Soglow scarf designs featured on the blog these past two days. 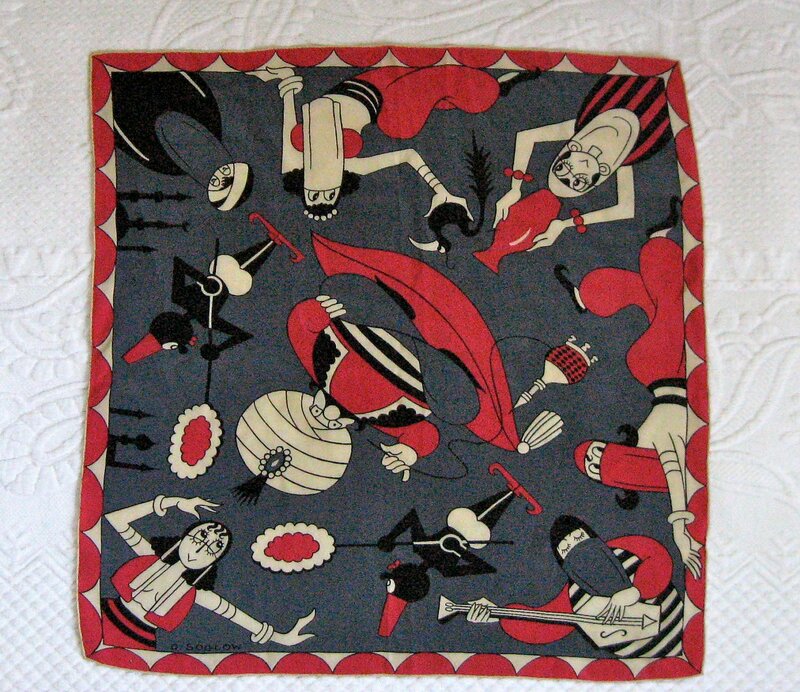 There are, no doubt, other color combinations of these as well of the other Richard Farrar scarves designed by New Yorker artists. Readers who come across these rarities in bottom drawers or at estate sales should photograph them and send them in for the sake of posterity. 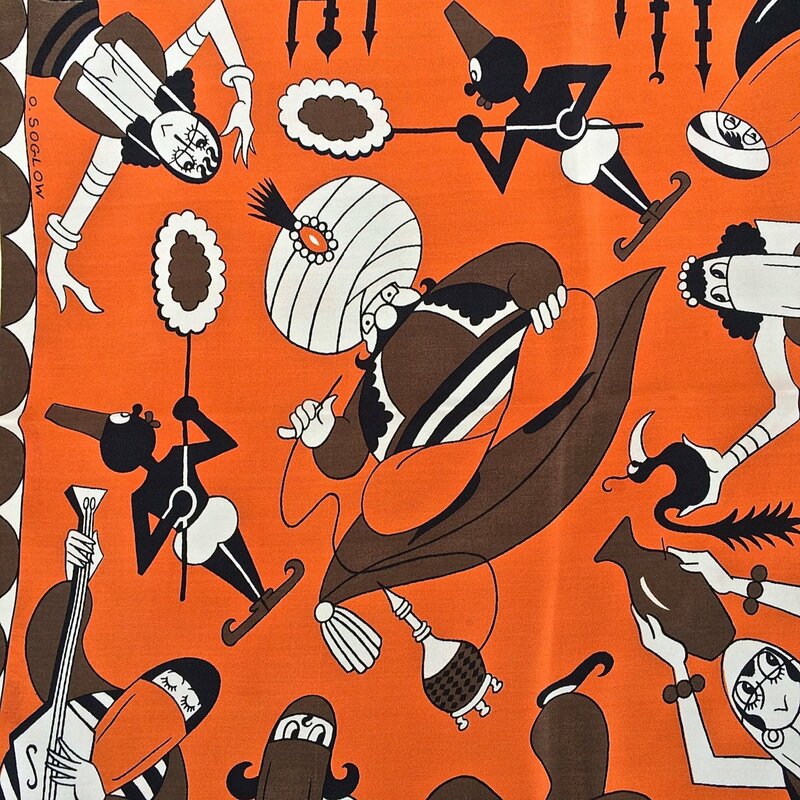 If there were an internet seventy years ago, all these scarves would have been immortalized from day one, but there wasn't so it's up to us to play catchup. 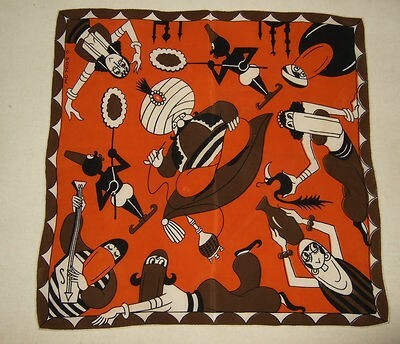 The one Richard Farrar scarf in the series we have yet to find a single example of is the one by the great Helen E. Hokinson. Scour the countryside, readers! But enough about scarves. 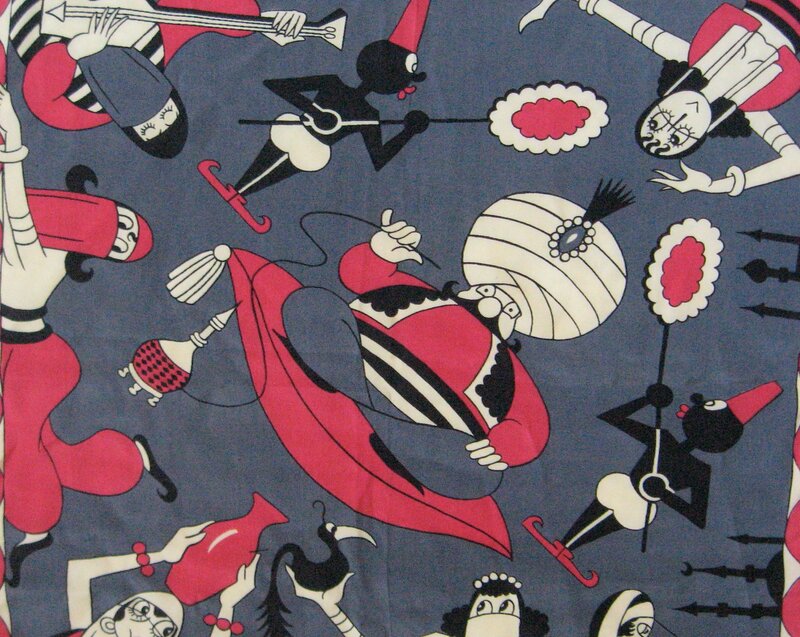 Original art by Otto Soglow is always welcome here on the old blog. 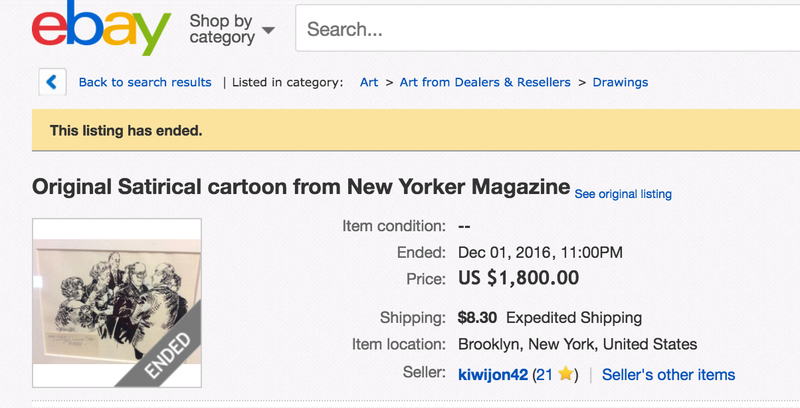 Rare published cartoons are also sought after. A Signed Copy of So You're Going to Buy a Book! Open Your Hands Wide, Embrace Happiness! 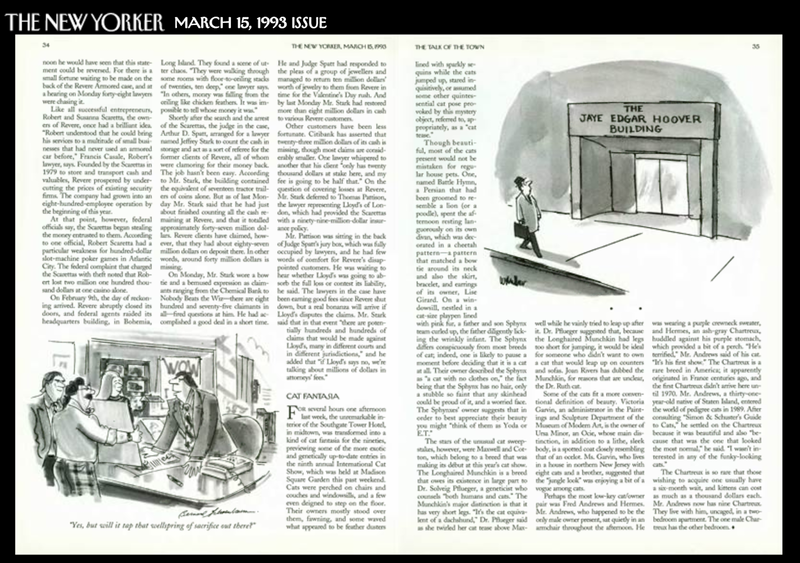 Attempted Bloggery brings the world outstanding work by New Yorker artists past and present. 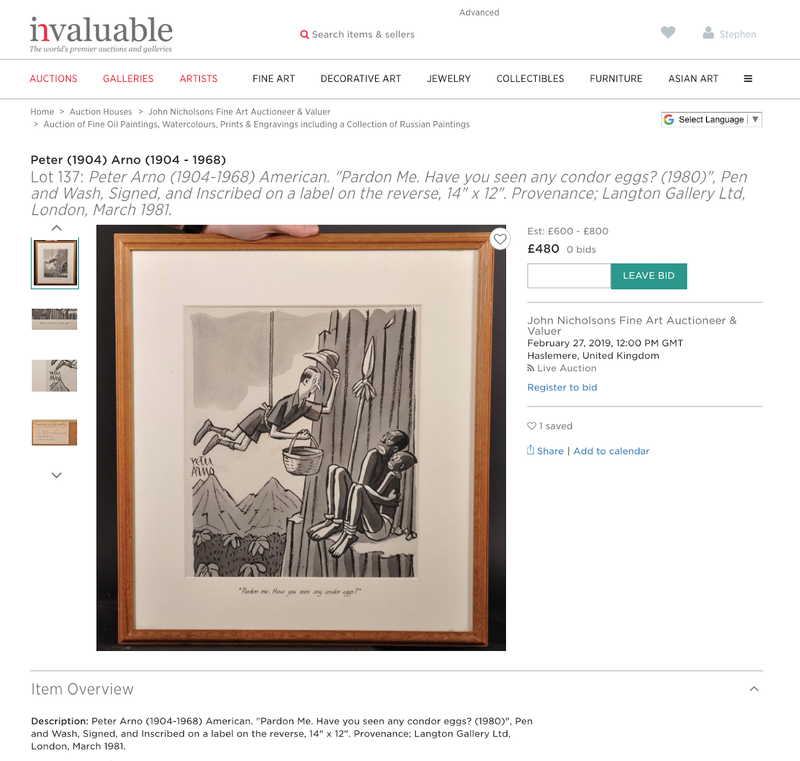 Motivated readers—that's you—can assist incurable bloggers—that's me—by providing high-resolution scans or photographs of original published or unpublished art, variants, sketches, or correspondence. Despite seven years of more or less daily online subversion, I have as yet been unable to get any legitimate dictionary to include the word bloggery. The word, which I was not the first to coin but was the first to overuse, is listed only in the online Urban Dictionary where it was derided in 2006 as a sort of blog blather. Even worse, to the monumental OED it is considered a non-word. I therefore urge careful writers to use the noble new word bloggery whenever appropriate, particularly in print, and to forward any and all citations to those stodgy old lexicographers at the OED. 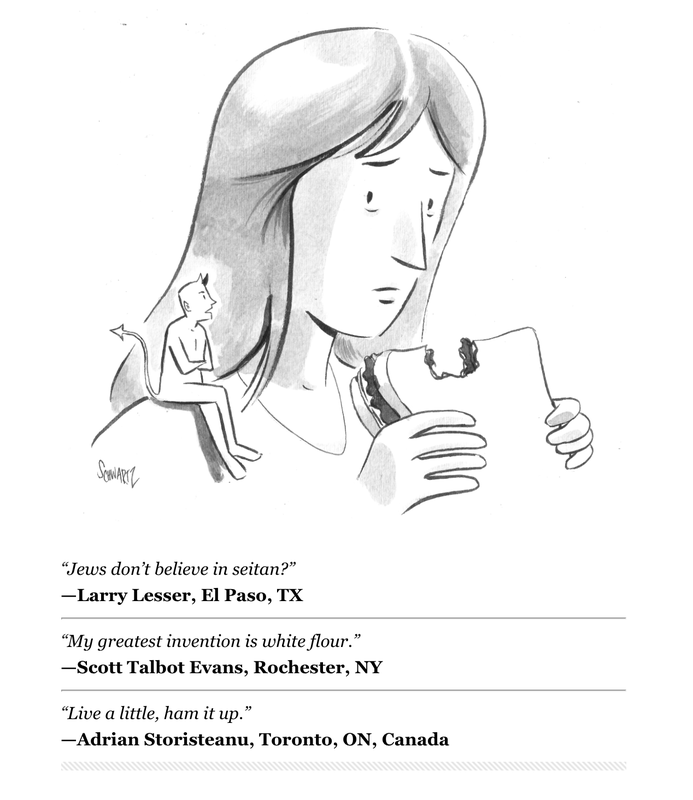 Attempted Bloggery supports net neutrality. All copyrighted images appearing here as fair use remain under copyright by their respective owners. Awesome Inc. theme. Powered by Blogger.